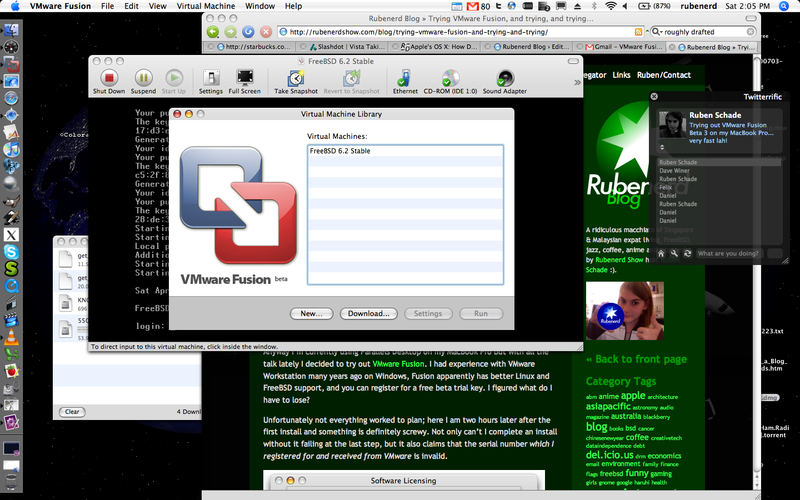 For those interested in virtualisation on Mac OS X, VMware's Fusion beta product was bumped up to version 3 last night. Amongst other improvements, the critical feature we've all been waiting for was bundled in: the ability to disable debugging mode! From what I can tell from their website and user forum, as part of the official VMware testing process most of their beta products have a built in debugging and logging setting which allows the development team to get real world usage information, at the expense of speed of course. By allowing the disabling of this feature in Beta 3, one can assume they've reached the level of development where things are becoming more stable and closer to the final product. From my own experience playing around with FreeBSD in a virtual machine this morning (at Starbucks over a Caramel Macchiato of course!) I can say by disabling the debugging mode it is noticeably quicker, especially in scrolling lists and so forth. I haven't yet had the chance to test out the 3D acceleration because I use Windows 2000 not XP in virtual machines. Parallels Desktop still seems a bit quicker, though I'm sure when VMware releases a mature product that gap will close. In regards to student pricing, one of the guys on the VMware support team suggested I look into the VMware student programme which allows the licencing of their products by universities and schools and allowing those licenses to be used by students. I very much doubt my uni would be interested in such an exchange given they have their own (in my opinion very clunky!) disk imaging system in place, but we'll wait an see. Was more of an answer than I got from the Parallels Team. * Improved performance: You now have the option of turning off debugging features in VMware Fusion to enjoy even better performance. * Support for Boot Camp: You no longer have to choose between Windows or Mac—run Windows XP side-by-side with Mac OS X off your existing Boot Camp partition. * Windows Easy Install: Just answer a few simple questions, insert your Windows CD, and VMware Fusion will automatically create a Windows virtual machine that is optimized for your Mac. * Virtual machine packages: Virtual machines are now encapsulated in a single, easy-to-manage package. Move your virtual machines to another hard drive or Mac simply by copying a file. * Enhanced virtual machine management: Managing multiple virtual machines and changing virtual machine settings is even easier with the Virtual Machine Library. * Improved international support: European and Japanese Apple keyboards now work properly in virtual machines. Older post → The joys!